All Sunday Night Football Games are broadcast by NBC who requires users to authenticate through there cable or TV service provider to watch a live stream of the game online. There are some options, however, for those who have cut the cord. If you have a TV subscription with a verified provider you can authenticate and watch online at NBCSports.com, or through a variety of TV connected devices. Many of the Online TV services such as Playstation Vue, Sling TV, Hulu with Live TV, Direct TV Now, or YouTube TV include NBC as part of their streaming packages. The offerings, however, are dependent on your individual location. How do you find out if NBC is offered in your area? Your best bet is to visit each of the sites, enter your zip code, and see if NBC is offered it your area. Sling TV currently has the lowest monthly price of all those online TV providers at $25 / month. Thanks to Verizon’s expanded mobile rights deal with the NFL, all fans can live stream Sunday Night Football on their phones by way of the Yahoo Sports App or the NFL app. All you need to do is install one of those apps on your Android or iOS device. 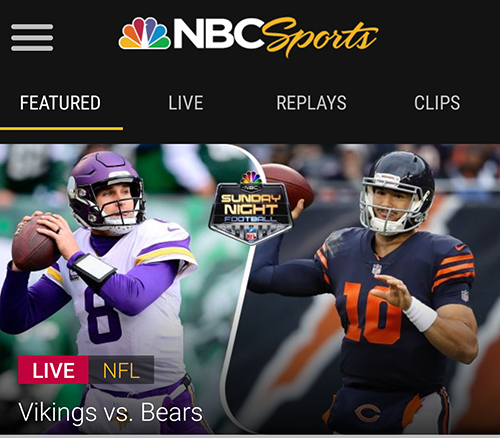 The NBC Sports app provides another option for mobile users. This option, however, will require you to authenticate with your TV provider to be able to watch the game. Sunday Night Football does not have great options for cord cutters. There are, however, still plenty of ways to enjoy the game online or on your mobile device.